Luciano Muñoz Sessarego (looch) added a comment to T56950: UI Paper Cuts (Parent Task). Transform Orientations should be split for Translation, Rotation and Scale, so you can have each on it's own. Luciano Muñoz Sessarego (looch) added a comment to T63193: Animation Editor Scrubbing Area. what if the markers can only be selected by holding a modifier key?, I think it would be better, because really you dont want to move your markers by mistake nor that often. Luciano Muñoz Sessarego (looch) added a comment to T63522: Icons for select tool new/add/subtract/difference/intersect. Luciano Muñoz Sessarego (looch) awarded T63526: Show parenting hierarchy in outliner view layer view a Like token. Luciano Muñoz Sessarego (looch) added a comment to T63527: Move collection visibility panel from popover to sidebar panel. no that panel is super useful in production! Luciano Muñoz Sessarego (looch) added a comment to T62895: Rigify: IK2FK / FK2IK - not working on 2.8. Luciano Muñoz Sessarego (looch) created T63485: Rigify 2.8 - general improvements..
Hey thanks for the great feedback and seems that we're mostly on the same page. Luciano Muñoz Sessarego (looch) updated subscribers of T62895: Rigify: IK2FK / FK2IK - not working on 2.8. Here i'll try to detail a few things I keep on finding that could improve rigify a lot. Luciano Muñoz Sessarego (looch) added a comment to T61578: Outliner Visibility Update. @Luciano Muñoz Sessarego (looch), we discussed something like this, see notes above. What if "visibility, excludility and rendereability" are by default just one button, so if the object is visible, is included, and rendereable, if the visibility is off, its excluded, not rendereable, not visible not even calculated in the depthsgraph, unless you want to have it invisible in the viewport but want it rendereable then you can override that "manually" I think it would be much simpler to use for starters and would make more sense. Luciano Muñoz Sessarego (looch) added a comment to T57918: Left Click Select tweaks and fixes. Luciano Muñoz Sessarego (looch) awarded T63035: Undoing in pose mode destroys the entire pose. a Heartbreak token. Luciano Muñoz Sessarego (looch) updated subscribers of T63035: Undoing in pose mode destroys the entire pose..
@Jacques GANGLOFF (jacques) lucke, maybe it is!, have we got any solutions for this yet? okay the panel now works if i generate it in 2.8. Luciano Muñoz Sessarego (looch) created T63035: Undoing in pose mode destroys the entire pose..
ah okay, I'll try that!, thanks! any pointers on how to update the code? though I have to mention that panel is the rigify addon panel, it isnt generated on the go when the rig is created. Luciano Muñoz Sessarego (looch) created T62895: Rigify: IK2FK / FK2IK - not working on 2.8. Luciano Muñoz Sessarego (looch) added a comment to T52167: Rigify "Rigify Type" lags bone properties panel..
Luciano Muñoz Sessarego (looch) added a comment to T61907: Interaction mode dropdown inverted after recent UI changes. I think a lot of menus now need to be reordered because they come up by less important to more important. Luciano Muñoz Sessarego (looch) added a project to T61727: Quicktime Animation Rendering Crashes, every time since 2.79 up to 2.8: BF Blender: 2.8. Luciano Muñoz Sessarego (looch) created T61727: Quicktime Animation Rendering Crashes, every time since 2.79 up to 2.8. Luciano Muñoz Sessarego (looch) awarded T53058: Crash when rendering to Quicktime RLE codec a Heartbreak token. Luciano Muñoz Sessarego (looch) added a comment to T53058: Crash when rendering to Quicktime RLE codec. hey I think this bug is still in 2.8! i think you guys are doing a great job, keep it up! I think we're overcomplicating the outliner for options that seem and feel far more advanced than what the common user will understand, I dont think they should be taken away they are all stuff i believe i would use one way or an other but in the outliner I would only keep one or two options visible as previously suggested like selectability and visibility, but I'd make visibility affect be for both viewport and render (by default). Luciano Muñoz Sessarego (looch) added a comment to D4264: Splitting/Joining Feedback. Luciano Muñoz Sessarego (looch) awarded D4264: Splitting/Joining Feedback a Love token. Luciano Muñoz Sessarego (looch) added a comment to T52758: Rigify: feature proposal: allow registration of custom rig types. 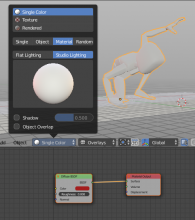 Luciano Muñoz Sessarego (looch) added a comment to T54943: Blender 2.8 Defaults. Luciano Muñoz Sessarego (looch) added a comment to T53047: Tool System Proposal. and shows a little bit how these kind of manipulators could improve experience for text editing aswel, like in this case kerning, just watch a few seconds at the frame I posted. Luciano Muñoz Sessarego (looch) added a comment to T54661: Gizmo Design. would there be a possibility to have the gizmos not dissapear maybe just dim when using them, the case with rotations in euler is that with the gizmo dissapearing is really hard to see how the euler axes are behaving. also when using the location axes, if you have done rotations in the character, there is no way to use an axis specifically without it modifiying more than one curve what in maya would be "parent axis" mode, i would propose that this would happen when setting the axes to "normal" (instead of local or world), or introduce a special one for it. Luciano Muñoz Sessarego (looch) added a comment to T54989: FaceMaps Phase 1: bone selection & bone display. Any chance you see that facemaps would be able to drive other types of properties via drivers or something without it going trough bones? Luciano Muñoz Sessarego (looch) added a comment to T54653: Driver Workflow Design. also this is very related but not exclusive, in 2.77 the pinning of the properties doesnt seem to work correctly, which is what really messes up the current driver creation workflow, if that gets fixed, then this will be even more powerful! Luciano Muñoz Sessarego (looch) created T56270: File crash when trying to save this one. Luciano Muñoz Sessarego (looch) added a comment to T56184: Dynamic Paint generated Vertex Influence affects Size of Particle system but nothing else..
Ah darn, why does it work with size and not density? Shouldnt this limitation affect both? Luciano Muñoz Sessarego (looch) created T56184: Dynamic Paint generated Vertex Influence affects Size of Particle system but nothing else..
Luciano Muñoz Sessarego (looch) updated subscribers of T54943: Blender 2.8 Defaults. Luciano Muñoz Sessarego (looch) awarded D2424: Add font selection to VSE text strips a Yellow Medal token. Luciano Muñoz Sessarego (looch) added a comment to T54963: Industry Compatible Keymap. So in essence the "industry standard" keymap is just a mix of the most common hotkeys from every major software... in the end someone is gonna have to do the maya keymap, the max keymap, the houdini keymap, and the cinema 4d keymap, and this "industry standard really weirdly mixed mix of things " will become obsolete pretty fast. Luciano Muñoz Sessarego (looch) added a comment to T53945: Blender crash after enabling GPU render on Mac. Need to restart computer before Blender can be used again. Luciano Muñoz Sessarego (looch) awarded T55674: Blender 2.8 Beta Milestone a Love token. Luciano Muñoz Sessarego (looch) added a comment to T54896: GP Branch: UI design for topbar/tools integration. Luciano Muñoz Sessarego (looch) added a comment to T55162: Blender 2.8 Blender Keymap changes. @Brandon Ayers (thedaemon) well the idea is that now you dont have to go through double tapping A, wich meant selecting everything before deselecting, which in heavy scenes was really a big fat mess. Ill have to say that search should be spacebar again, its the only way that no matter what keyboard youre in, youll have it in front of you, it was one of the first things everyone teaches including me to their students because you can use it to learn hotkeys, or to find obscure things that regularly dont use. with the tilde key that you chose, in my spanish keyboard i have no access to spacebar by default and i bet it happens to many other people. also having that toolbar in the spacebar is very very very reduntant. Luciano Muñoz Sessarego (looch) added a comment to T55429: Mirror Weights to symmetrical bone removes original weights. I think it's broken, even in the mirror button tool tip is described as "flipping when both sides are selected, otherwise copy from unselected". and it does not perform as it is expected at all. again thanks for all the amazing work guys! Im glad that you guys are revisiting all this and keep being open to input. I think Tab back to modes is great, though i find that having 123 for the different components is a waste of keyboard, and should be grouped under one hotkey for the same reasons Tab for modes, they're all related to eachother and its better to learn just take hotkey with a mouse flick to also save space for more hotkeys to come. For instance when it comes to the posemode with the breakdowner / relax / etc, it would be cool to tap the hotkey to activate the tool, but hold to get a pie menu and with this choose what's the one that you want to use. that would be neat. and i think its a methot that should work for several things, like for pivot point, tap the "." and jump back and forth between the two last used, but, hit and hold, get a pie menue to chose the one to change to. same with transform orientation, and also with O for proportional editing, hit, turn on and off, hold, get a pie menu with the diverse options. Luciano Muñoz Sessarego (looch) updated subscribers of T54711: 2.8 UI: Small, independant UI tweaks. hey @William Reynish (billrey) I have few question about Lekker Presets, which I really like and always wanted to have a consistent reliable system like this in blender. 1.- I see in the mockup that when you'd add a preset you'd get to put the name, to change name of a preset would you just double click it? or maybe is it going to be like materials, where youre able to change the name to the selected one right in the box? 2.- I think most panels on the could use a preset manager, there are a ton of panels with a ton of settings to remember or to tweak, but also in some cases maybe it would be nice to have a complete property window, for instance for the rendering properties maybe you want to have a preset that covers all setings but then just customize your output, maybe it would be good idea to give it a though. also it would be really nice and useful to be able to select the attribute (not the value) and to be able to sync it with the graph editor, timeline and dopesheet, so if i select rotation x, it would only show rotation x for the selected object in the mentioned editors, that would ease and fasten the workflow of editing the intended attributes by a lot. Luciano Muñoz Sessarego (looch) added a comment to T54991: Implement motion path drawing code in draw engine. its important to show the keyframes in the motion path of the selected object, which is not necesarilly the object from which the motion path is calculated. I noticed: "Pie Menus, Switching modes" is listed. Does this mean tab key always opens a pie menu instead of toggling edit-mode? From discussion w/ @William Reynish (billreynish) I was under the impression this was not desired behavior and pie menu should only be enabled using sticky keys (hold tab shows pie menu, click to toggle editmode - for eg). Luciano Muñoz Sessarego (looch) added a comment to T55237: QT Animation Crash. it doesnt require alpha, but its supported. Luciano Muñoz Sessarego (looch) created T55237: QT Animation Crash. Luciano Muñoz Sessarego (looch) awarded T54812: COW Operators: Pose Armature a 100 token. in regards to drawing, maybe there could be an option to randomize colors for them, so each new path gets a different color, though they should probably go in order, Ie, 1 gets red, the second one gets green, the third one gets blue and so on, much easier to see, and the thicknes definitelly should be like what in 2.79 wa 2 px or so. Re. expressions, we discussed this during the design session. We may revisit it. With this design, we wanted to strike a balance, where this interface remains lightweight and quick to use, while the full Drivers Editor remains as an area for full control. We initially considered expressions more of a 'deep' feature, but perhaps we can find a way to include it here, as long as it doesn't take up too much space or is too cumbersome to use. Luciano Muñoz Sessarego (looch) added a comment to T47840: blenrig: fix copy attribute dependency. Luciano Muñoz Sessarego (looch) awarded T47840: blenrig: fix copy attribute dependency a Burninate token. Luciano Muñoz Sessarego (looch) awarded T54653: Driver Workflow Design a Love token. I wouldnt activate Node Wrangled by default, but i'd steal some of it functions and make them standard, like previewing node outputs (ctrl shift click), lazy connect, or switching nodes, but to me the rest seems kind of messy to have it as a default on, though those functions should definitelly come bundled. hey also when sliding or creating edge loops the "correct uv's" option should also be default... right? Luciano Muñoz Sessarego (looch) added a comment to T55027: 2.8 UI Tools: Favourites Bar / Specials Menu Design. will you be able to add a script as a button too?, like just paste it into it and when you click the button it will run the entire script? Would be nice if user could add any sort of command as a button without having to create an addon and go through that whole convoluted process. Luciano Muñoz Sessarego (looch) added a comment to T54710: Overlay visualisations . Also would be nice to be able to turn the grid off for when you're in ortho. i was wondering why "object overlap" is under the shading options instead of the overlays ?. also, if im using "single color", but with the material option... should i be seeing the material? also, why is "texture" a different thing "mode", it seems to fit in between the options of single color to me unless it has some other special options that wouldnt work in tune with single color. Luciano Muñoz Sessarego (looch) added a comment to T54790: Outliner collection display and editing. Luciano Muñoz Sessarego (looch) added a comment to T54908: Workbench UX design. You think we could make the "relationship lines" only show when the object is selected and have a gradient color from parent to child (maybe from the color of the selected bone fading to black) so one can actually know how the hierarchy is built?. Also it could be nice to have a secondary color that tells you how bones or objects are related to other by parenting and by constraints with different colors for each?. for example y select abone, and all the direct childs get this secondary and the bones that have a constrain pointing to this bone will get an other color. Luciano Muñoz Sessarego (looch) added a comment to T54951: Properties Editor Design. They do seem hard to catch at a glance, and I do agree that icons in this case are more selfexplanatory, could we do Icons + the colored number field?, It feels like that would read much better at a glance. Yes, that sounds great, tapping could just bring you from the last mode used back to object mode (having edit mode be the default one to go to when you just started a session), and holding will get you the pie so you can quickly choose the one you want... this would work with very many tools if not all of them. Why render display "new window", I thought one of the base ideas of blender was no obstructing overlapping windows... ? Luciano Muñoz Sessarego (looch) added a comment to T54792: View layer overrides with override sets. if say I have 5 cubes all with different colors, and I want to have a layer where they all have other 5 colors, I should create 5 collections, one for each cube to do the override, and then attach those collections to the new layer? Is that the intended workflow? Luciano Muñoz Sessarego (looch) awarded T54896: GP Branch: UI design for topbar/tools integration a Love token. Luciano Muñoz Sessarego (looch) awarded T54949: Bone Selection Design a Love token. Luciano Muñoz Sessarego (looch) added a comment to T54949: Bone Selection Design. will we be able to turn off the "interactive creation" of primitives? This looks amazing. I will let you know that I strongly support all the things you have mentioned here. But with the risk of opening a can of worms (I know how difficult these design issues can be) how will we be able to tell properties with multiple states? For example: What of a property is overwritten by a value that is animated? Do we see multiple small icons? Can they be combined somehow? @Leandro Cavalheiro (lcs_cavalheiro) yeah maybe there should be a base option in the settings that does it for your every scene, but then that can be overriden on a per object / file basis ? Oh yes, totally, I was saying if you're thinking of a combined workflow with this and facemaps, say i want to use facemaps for the facial rig, but for the rest of the body just bare bones. Have you put some thought into how to combine bones with the face selection thingy? cant wait to test the new stuff out! actually forget my comment, this makes more sense. wouldnt it be nice that the mesh around the bones would dim automagically while you hover around a bone that's inside the mesh? this could be a property for the bone to have on / off, so you can set in the rig the bones that will benefit from this, maybe by default they're all on, and if youre getting into more complex rigs you choose not to have this function for certain bones. Hey that same INSET widget that appears in the top bar, would be useful for "pose breakdowner", and also for when using stuff like scaling brushes, or intensities of brushes and such stuff, would be a great addition that nothing depends completely on the mouse!